After a tiring day of work and managing to clear all the deadlines, how about resting those strained eyes and mind with a good night’s sleep? Well, that is, if you get one! It becomes increasingly difficult to keep up with the schedule without those precious hours of sleep to charge you up. And how better can that be done without using any of those medications? Sleep Shepherd, a brainchild of Dr. Michael Larson is a device that provides the user a deep and comfortable sleep without using any kind of medication. The idea originated when Jessica, daughter of Dr. Larson was diagnosed with a sleep disorder. Having earned his Ph.D. from MIT, he used his Mechanical Engineering background to create a drug-free solution to a better night’s sleep. Unlike other sleep tracker devices, the Sleep Shepherd Blue promotes better sleep while simultaneously tracking brainwave activity. It consists of thin speakers and conductive fabric Electroencephalograph (EEG) Sensors. The device also comes with an app for both Android and iOS smartphones that will automatically track your time in deep sleep, total time asleep, head orientation, and the time you fall asleep. Binaural Beat System: These are the tones that are played from each earpiece but are at different frequencies from one another. Simply put, they have the ability to raise or lower the brain rate depending on the frequency of the tones set. 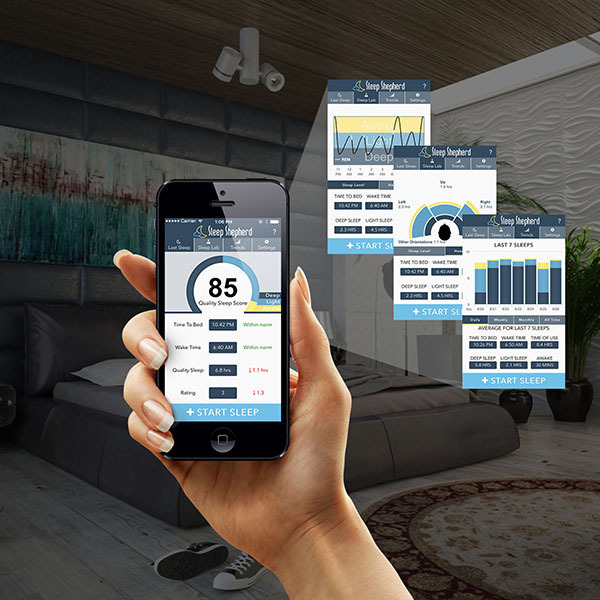 The device administers binaural beats through a patent-pending biofeedback system and the collected data is synced to the companion app in the morning. EEG Brainwave Monitoring: In order to maximize the effectiveness of the Binaural beat system, the device constantly varies the frequency of the tones by tracking the brain rate in real time. Joe Griebel, Principal Design Engineer of Sleep Shepherd says that while they have been actively competing with the likes of Sense, FitBit, and Beddit, creating a system that could be worn comfortably and obtain accurate signals for a reasonable price was considered as the major hurdle for the product. The gadget is aimed at people who would want to enjoy sound sleep without the usage of any kind of medication. What’s more, our readers will get 10% off on purchasing the product after entering the promo code: DOPE10.